Grandma and Grandpa Squirrel give Secure and Insecure each a brand new hammer, building kit, and nails for their birthdays. He starts reading the directions, putting the pieces together, and using the hammer with Papa’s help. His hammer is well used and what fun they have! Then he puts his hammer on display in his room. He doesn’t want anyone to scratch or break his hammer so he never shares it. Insecure’s hammer is still beautiful, shiny and brand new. Did he have any fun? Mama and Papa Squirrel give both Secure and Insecure garden tools and seeds. Secure plants cucumbers, tomatoes and strawberries. He invites his friends over to use his garden tools too. Insecure doesn’t want his beautiful garden tools to get dirty, chipped or broken. He puts them on display next to his hammer. Secure and his friends have such a big harvest, they decide to share the cucumbers, tomatoes and strawberries with less fortunate squirrels. Papa takes Secure and his friends to deliver the produce. Insecure doesn’t want to be seen in the poor neighborhood or with his Papa, so he sits at home. “My dear little Insecure, do you know why Papa’s arms are the way they are? Shortly after you were born, Papa risked his life saving you from Yanar Dağ! 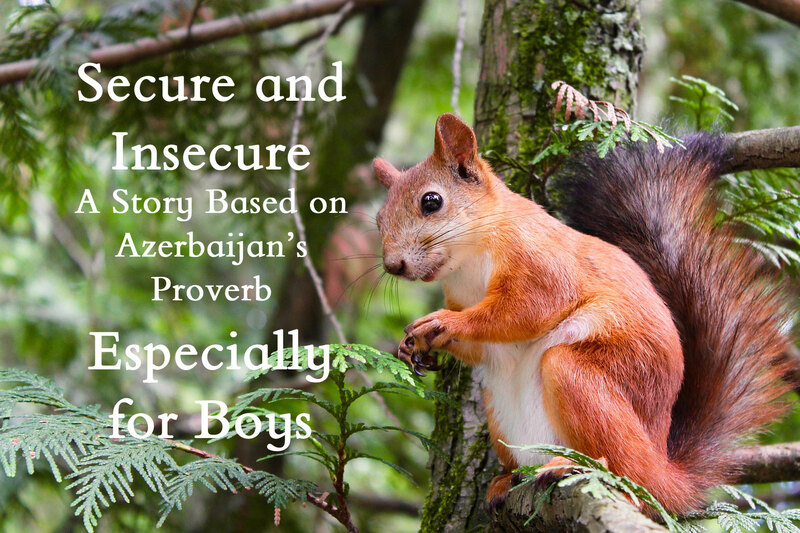 Papa knew the Azerbaijan Proverb: Beauty without virtue is a curse. And do you know what? All his plans to do good, banish all anxious, nervous, and embarrassed thoughts from Insecure’s mind. He uses his hammer and garden tools to bring joy to others. And he isn’t Insecure anymore. He is Mr. Confident.